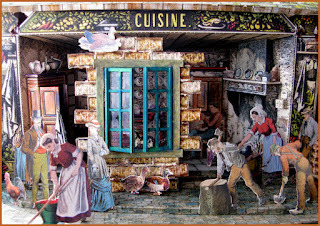 Longtime paper model builder Thomas Garbutt first contacted Castle in the Air late last year, inquiring about our collection of 1800s Pellerin paper model reproductions. 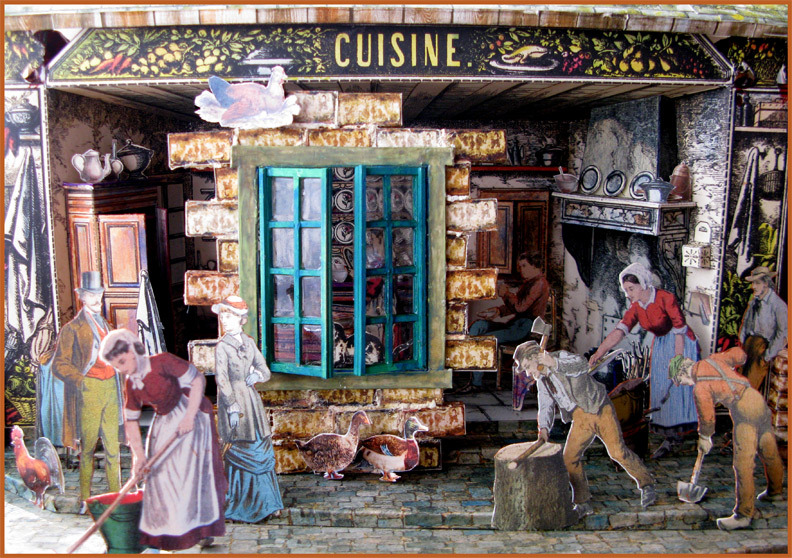 He has since become our “paper-modeler-at-large,” constructing our models at his home in New York City and sending them back for display in our gallery. If you haven’t yet read our interview with Thomas about model-making, you can do so here. Equal parts enthusiast and educator, Thomas is preparing a series of “guest lectures” for the Castle in the Air blog. Each of these lessons will introduce beginners to the various tools and techniques of paper modeling. Even if you have some experience working with these delightfully absorbing models, you may learn a thing or two from Thomas. Thomas’s first lesson deals with modeling glue and its varieties and uses. When I began kindergarten in the mid-1950s we had something called paste. It came in bulk in a big jar. My classmates and I simply stuck our fingers in and each removed a glob, then spread them on small pieces of cardstock provided by our teacher, Miss Roselee. The paste had the consistency of margarine, and it smelled very minty. Being only five years old at the time, I thought it was either toothpaste or the stuff they put in the center of Oreo cookies. It didn’t take long for me to want to taste it, and I quickly learned that it was neither. I left paste behind in kindergarten, but my love of paper crafts stuck with me, so to speak. Like all beginning paper model builders, I found the variety of available glues to be a bit confusing. Finding the best adhesive for the job sometimes comes down to basic trial and error. Here are a few thoughts on products I’ve had success with over the years. When working with paper models, the first adhesive that comes to mind is white glue, also known as PVA (polyvinyl acetate) or by the brand name “Elmer’s Glue-All” after its bull mascot, who happens to be the husband of Borden’s Elsie the Cow. Despite the association, neither of these glues contains any animal products. White glue is not my first choice for paper model building, simply because it has too much water in it. The excess water is absorbed into the paper, causing the fibers to expand and your model to wrinkle. If you want to glue down paper already wet all the way through, though, white glue is a great choice. The expanded fibers will shrink evenly and the paper will become very taut. This is how the paper on the back of framed pictures is applied. Generally speaking, though, white glue is not terribly useful to us. 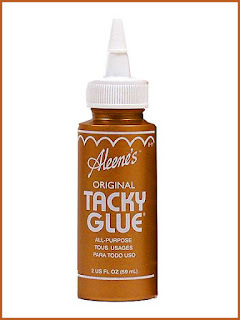 My everyday glue for paper model building is either Sobo Premium Craft Glue by Delta or Aleene’s Tacky Glue. Both have low moisture content, set up quickly, dry clear, and create a strong bond. Either of these two can be your basic “workhorse” glue you will use most of the time. They can be applied to large areas with brushes or cardboard scraps. Flat toothpicks make for excellent tools to spread the glue onto small parts. For gluing down larger areas—such as laminating a sheet of paper to a backing stock such as mat board or heavy stock—I use spray adhesive. This kind of glue allows the pieces to bond very smoothly. Simply spray both surfaces and let them dry for a few minutes before pressing them together. Spray adhesive bonds on contact, so it is very important to line things up correctly the first time. There are no “do-overs” or second chances. And unlike white glue or tacky glue, spray glue allows no margin for slight adjustment. It does have a rather strong chemical smell as well, so it is best used in a ventilated area. Spray glue works equally well on porous and nonporous surfaces. A spreadable version of spray glue that also bonds on contact is rubber cement. This, too, has a strong chemical smell. Rubber cement comes in a jar with a spreading brush built into the cap. Use the brush to apply glue to both surfaces to be joined, let them dry a bit, and then press the pieces together. Glue sticks seem to be another useful adhesive at times. The glue has no odor, is water soluble, and has some give to it before drying, which allows for small adjustments. The house-brand glue sticks sold at Staples seem to be a good choice as they work well and are relatively inexpensive. I have noticed that glue sticks can cause some paper wrinkling, so it’s best to use them on small surface areas. Aside from the actual gluing technique, the critical task is keeping the excess glue off your fingers so you don’t spoil parts of your model where no glue is meant to be. This for me continues to be a constant annoyance which I have overcome with limited results. No one can ever attain perfection, so we all just keep trying. Thomas and I appear to be adhesive soul mates ;) What I wouldn't do for unlimited buckets of Aleen's Tacky Glue and rubber cement. This is a very useful article about gluing. Keeping your fingers glueless is easy if you keep a dampened washcloth crumpled in a small dish within reach. You will find yourself "pinching" this cloth often as you glue. Keep a dry washcloth as a "mini towel" nearby. A short bamboo skewer is a very useful glue applicator. If you clean it off at the end of your gluing session, it will last for quite awhile!